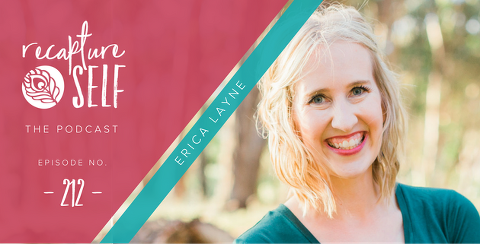 Today I am chatting with Erica Layne author of the popular blog Let Why Lead where she’s teaching moms about the freeing power of living by their WHY. She is a mom of three, a sunset chaser, and an unashamed self-help lover. She believes in living simply, seeing beauty in the everyday, and helping women believe their best IS good enough. What it means to be a deep, feeling, sensitive mom in a fast paced and busy world. How to enjoy the writing process as a grownup – taking the journaling practice you loved as a kid and making it work during mid-life while raising kids. Why living in your truth is important and freeing. And Erica shares one of her FAVORITE tips for finding balance as an introverted mom. HOMEWORK: SNAP A PHOTO THAT SHOWS HOW YOU’RE JOURNALING OR WRITING THIS WEEK. COME FOLLOW ‘RECAPTURESELF’ ON INSTAGRAM. USE THE #RECAPTURESELF WHEN YOU POST. I’LL SHARE OUT SOME OF YOUR POSTS THIS WEEK! One of the things I loved hearing Erica talk about today was about her top values of creativity and family. I’ve got a FREE 3 Day Photo Printing challenge coming up that’s aimed at helping you anchor into those values too. As a dedicated mom, I know you value your family and take TONS of pictures. But if you’re anything like me — those pictures have been sitting idle on a device just WAITING to be printed. If you’re ready to put ‘print photos’ back at the top of your priority list and show your family how much your memories mean head on over to this page HERE and sign up for the 3 Day Challenge. In 3 short days, you’ll walk away with a simple system to starting preserving and print more memories + you’ll get a personal photo project selected, organized, and ready to order. It was SUCH a pleasure to join you! Of the handful of podcasts I’ve done lately, I’ve got to say – I felt the most like myself in this one. You put a girl at ease!